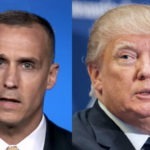 Last week Palmer Report brought you the story of how Donald Trump’s former campaign manager Corey Lewandowski appeared to be working as a paid foreign agent through is lobbying firm, essentially selling foreign politicians access to Trump himself (link). Amid heightening questions about whether Lewandowski might need to register as a foreign agent, he’s decided to take a different route: he’s quit. That news comes from Jennifer Jacobs of Bloomberg, who is reporting that Corey Lewandowski is quitting his consulting job, hence “distancing himself from negative publicity and conjecture he’s not following the rules” (link). While we wait to see whether his resignation satisfies the increasing public scrutiny over his actions at the firm, it’s still not clear what legal implications there may or may not be. For instance Michael Flynn, who formerly worked with Corey Lewandowski on the Donald Trump campaign, ended up retroactively registering as a foreign agent after it was revealed that he had been taking money from sources close to the governments of Russia and Turkey. Paul Manafort, who replaced Lewandowski as Trump’s campaign adviser, stated last month through his spokesperson that he was also registering as a foreign agent – but then he backtracked from it. So we’re not sure where this leaves Corey Lewandowski legally, and that’s for the authorities to determine. But it’s yet another instance of key Donald Trump campaign personnel ending up resigning amid accusations of being a paid foreign agent. Lewandowski worked for CNN after quitting the campaign and before taking the lobbying job; it’s unclear what he might do next.